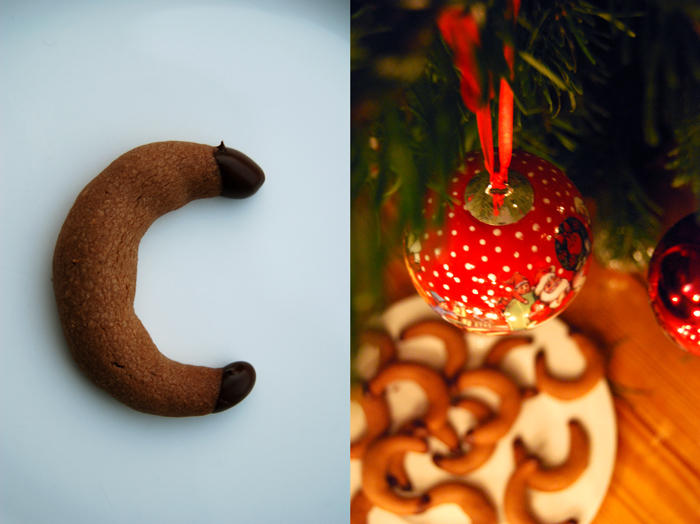 When I made these cookies the first time many Christmases ago I knew that a tradition was born. 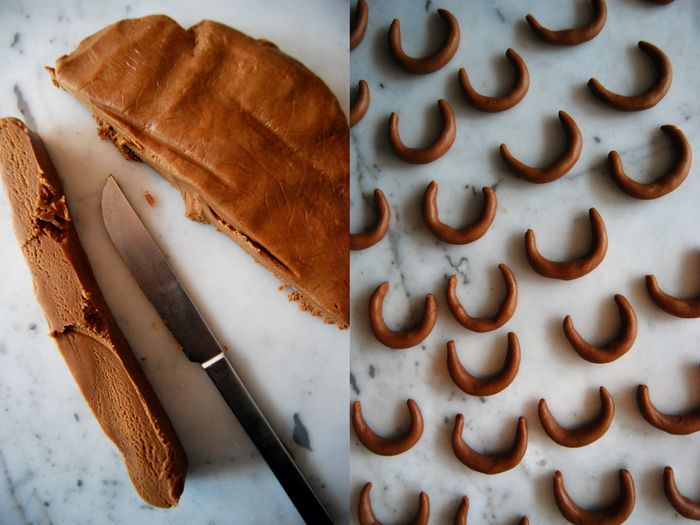 Every year, in December, I need a box of these crescent shaped cookies stuffed with Gianduja, which is also known as nougat in Germany and Austria and gives them their name: Nougat Kipferl. This nougat is made of chocolate and hazelnuts – different to the white nougat (or “Turkish honey”) which is made of almonds and honey. 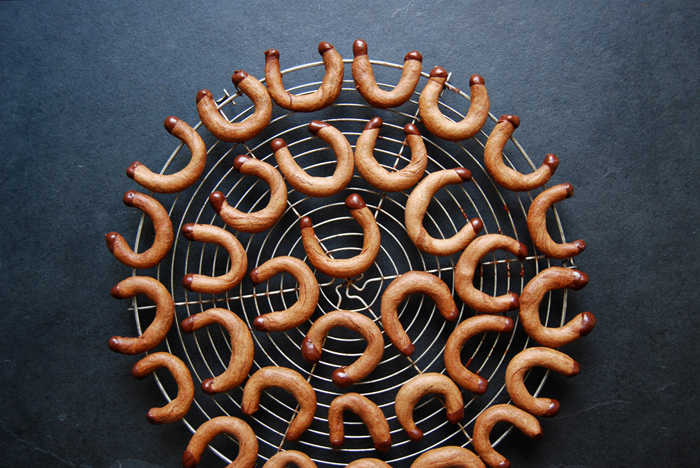 Another weekend, another Kipferl! These aren’t as tender as the Vanilla Kipferl which I made last week, they are more dense, but still crumbly. I add lots of Gianduja to the dough because I want more than just a hint of this taste. The bittersweet chocolate on the Kipferl’s feet isn’t just for decoration – it takes away a bit of the sweetness. The amounts I use in my recipe aim for a bigger batch of 90 cookies as I enjoy this pleasure just once a year. Mix the butter together with the nougat, this works best with dough hooks. Add the egg and continue mixing. Add the flour, vanilla sugar, baking powder and the salt and mix to a dough ball. Form a thick disc, wrap in cling film and put in the freezer for 45 minutes. Preheat the oven to 180°C / 355°F and prepare a baking sheet with parchment paper. Take the dough out of the freezer. Cut thick slices off the disc and cut these slices in walnut sized pieces. 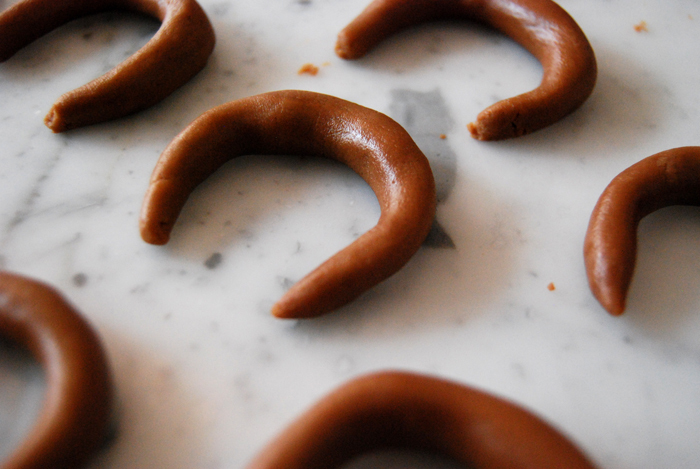 Roll your cookies into the Kipferl shape between your hands. Mind that the ends don’t get too thin as they would burn. Place your cookies on a baking sheet and bake for 8 minutes. Don’t let them get too dark. Let them cool completely before you start dipping their feet into the melted chocolate.